ImuPro is a concept that combines a sophisticated blood analysis for IgG food hypersensitivities with unique post-test guidance. 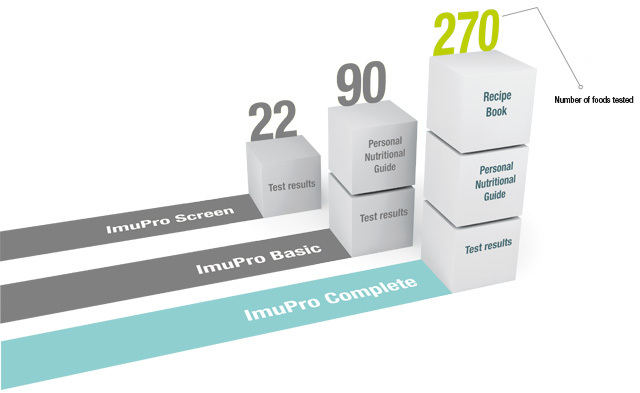 ImuPro Complete tests 270 foods and additives (including the 90 foods tested in ImuPro Basic). In addition to the typical kinds of meat, vegetables, fruits, cereals, milk and egg, their alternatives and region-specific foods are also tested. Furthermore, a huge number of spices, tea, coffee, wine and also thickening agents and preservatives are examined. Based on the results of the antibody titre, the foods tested are then categorized into three groups: not elevated, elevated and highly elevated. 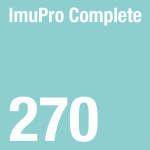 Click here to download an example of an ImuPro Complete report. Your diet can be changed very selectively based on the findings. This means that there will be a variety of alternatives for your 4-day rotation. You will receive a comprehensive report with accurate results at a glance and personal nutritional guidelines which lead you through your change in diet. Your results pack also includes individual recommendations for your 4-day rotation and a recipe book which is specifically tailored to your IgG reactive foods. Please visit our FAQ page as well as the FAQ page on R-Biopharm’s ImuPro main site (http://imupro.com/faq/) for answers to some commonly asked questions.